The main points of the speeches given by the President of the United States, the Israeli Prime Minister and the Chairman of the Palestinian Authority at the Annapolis meeting. Palestinian Authority chairman (Jim Young for Reuters, November 27). (The National Press Agency, November 27). i) Abu Mazen began his speech by thanking President Bush , Secretary of State Condoleezza Rice and those participating in the meeting, among them Arab-Muslim states, the International Quartet, the G-8 countries, members of the UN Security Council and European, Asia , African and Latin American countries. He said that such a broad spectrum of participants strengthened the resolve of the Palestinians to reach a historic equal agreement which would ensure the peace and security of an independent Palestine , of Israel and of all the countries in the Middle East . ii) He called the Arab peace initiative a "brave strategic plan” which sought a change in the nature of the relations in the Middle East and to usher in a new era. That would demand the end of the Israeli occupation of all the Palestinian territories occupied since 1967, including East Jerusalem , the Syrian Golan Heights and what remained of the occupied Lebanese lands (i.e., the Shebaa Farms). It would also demand solving the problem of the refugees in accordance with UN [General Assembly] Resolution 194 , as noted by the Arab peace initiative. iii) The negotiations regarding all the core issues of the final status agreement : Jerusalem , the refugees, borders, settlements, security, water, etc. had to begin immediately ("tomorrow”). iv) It was up to Israel to strengthen the negotiations " with direct, concrete steps on the ground: "to stop settlement activity, both extending them and by "natural growth,” "to get rid of the settlements,” reopen the Palestinian institutions which were closed in Jerusalem, dismantle the roadblocks, release the prisoners and ease the PA task of enforcing law and order. vi) The PA’s government will continue to implement the road map with regard to the struggle against anarchy, violence and terrorism , and to ensure security, order and the rule of law. The primary national Palestinian interest is to fight terrorism, regardless of its source , because that is a danger threatening all peoples. The Palestinians must be given a chance to build their civilian, security and economic institutions, and the international community must support and aid them in doing so. viii) Abu Mazen ended his speech with an appeal to the Palestinian people in the Gaza Strip and expressed his identification with them. He said sought the unity of the Palestinian people in the West Bank and Gaza Strip as a geographical and political unity . He ended by saying the suffering of the Palestinians in the Gaza Strip would come to an end. i) Despite his apprehension and doubt, he came to the meeting to extend his hand in peace and to begin a historic process of compromise between Israel and the Palestinians and Arab countries. ii) Israel had "many good reasons to refrain from coming to this meeting. Memory of failures in the near and distant past” weighed heavily on the Israeli side. v) The final negotiations will realize President Bush’s vision of two states for two peoples , a Palestinian state beside the State of Israel , which will be Jewish, democratic and live in security, the national home of the Jewish people . vi) The implementation of the agreement would "be subject to the implementation of all obligations in the road map, of all its phases and according to its sequence ,” as concluded between the two sides. vii) Implementing the agreement would be part of " a much wider complex ” which leading to peace with all the Arab states. He called upon the representatives of the Arab states to end their "boycott and alienation” toward the State of Israel, and said he acknowledged the importance and appreciated the contribution of the Saudi Arabian peace initiative . 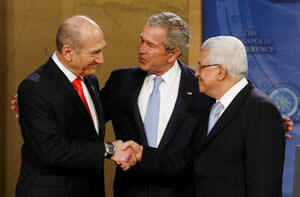 5 He added that Israel would relate to it during negotiations with the Palestinians. i) Nabil Abu Rudeina , presidential spokesman , said that the Palestinians had not agreed to the joint Israeli-Palestinian paper because the Israelis had raised unacceptable topics. " They [the Israelis] stubbornly insist that the country will be Jewish, and we have never accepted that . They were reserved regarding the Arab peace initiative.” Therefore the joint paer was replaced by the understanding read by President Bush. The test, said Abu Rudeina, will be what Israel does on the ground and the United States ‘ willingness to exert genuine pressure on the Israeli government (Radio Sawt Al-Arab, November 28). ii) Saeb Erikat , a member of the negotiating team, said that after Annapolis Abu Mazen wanted to progress in two directions: appointing sub-committees for negotiations as in previous rounds, i.e., committees for Jerusalem affairs, refugees, borders, settlements, water, security, etc. The other direction is fixing a date for beginning negotiations on the above topics several days after Annapolis (Al-Quds, November 27). i) Fawzi Barhoum, Hamas spokesman , said he was disappointed by the participation of Arab states. Regarding Abu Mazen he said that he went to the meeting without Palestinian support and that he did not have a mandate to change the rights of the Palestinian people. He said that Hamas would continue the "resistance” (i.e., terrorism) to restore Palestinian rights (AP, November 27). ii) Ahmad Yussuf, advisor to Ismail Haniya , called the meeting "a waste of time.” He said that all negotiations with Israel in the past about minor issues were unsuccessful, so there was even reason less to hope that negotiations would find solutions for core issues such as Jerusalem , borders and the refugees. He said the Annapolis meeting was no more than a "farewell party” for President Bush (Reuters, November 27). iii) Sami Abu Zuhri, a senior Hamas activist , said that the main goal of the meeting was to serve Israeli and American interests, and not Palestinian interests. He said that Abu Mazen had commited a crime by agreeing to follow the road map , and that Bush’s statement was a step back because there were previous agreements which Israel had not implemented (Agence France Presse, November 27). iv) Ismail Radwan, a senior Hamas activist , expressed his sorrow that the meeting was one-sided and that only the suffering of the Israelis had been mentioned, while the suffering of the Palestinian people had not been mentioned at all (in point of fact, Radwan was incorrect). That was because, he said, the real terrorism came from the Israeli side and it should have been mentioned (Al-Jazeera TV, November 27). v) Salah al-Bardawil, Hamas faction speaker in the Palestinian Legislative Council , said that the Palestinian country which President Bush promised was "imaginary and indefinite.” He said that Bush had not defined its borders, a timetable [for its establishment] or its nature (Filastin al-‘An, November 27). 1 From Wafa News Agency, (Arabic), November 28. 3 A political program issued on June 24, 2002 , the realization of President Bush’s vision. It proposes a gradual, multi-stage and long-term solution to the Israeli-Palestinian conflict. 4 A letter sent by President Bush to the then prime minister, Ariel Sharon, on April 14, 2004 , in which the president recognizes Israel ‘s need for secure, defendable borders. 5 For further information about the Saudi Arabian peace initiative, see our April 6, 2007 Bulletin entitled "Reaffirmation of the Arab peace initiative by the Riyadh summit meeting (First summary and appraisal)” .